TDA2003 is a robust automotive grade audio amplifier IC. It supports up to 28 volts of operating voltage and can withstand input voltage fluctuation of 40 volts. 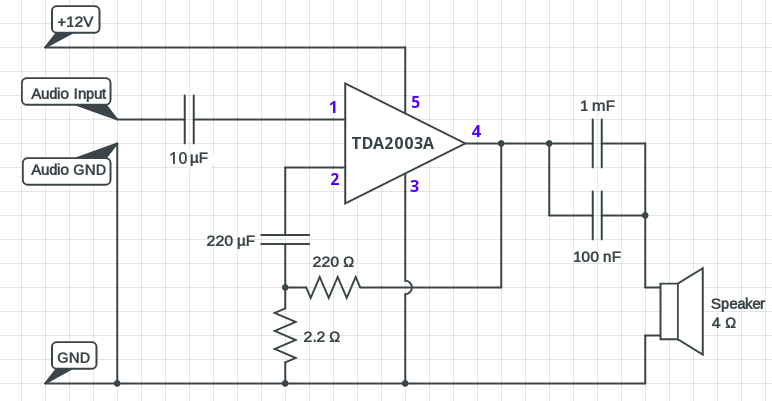 A TDA2003 amplifier circuit is very easy to make. It’s powerful enough to provide up to 10 watt RMS power easily. TDA2003 is manufactured by many different companies but they’re almost same internally. You may find TDA2003A, which is the improved version, manufactured by STMicroelectronics. There are several audio amplifier design based on TDA2003, you can modify your design a little. The circuit below is my favorite. These parts are not absolute, you can easily replace a component with it’s suitable substitute. I’m using the 100nF polyester film capacitor to minimize the electrolytic capacitor’s ESR. You may want to use an effective volume and and bass-treble control circuit before the audio input. Let’s have a look at the part list, though I’ve mentioned value of each component in the circuit diagram before. These components are just for making the tda2003 amplifier circuit board. You’re going to need a power supply, connecting wires and other tools too. Making the amplifier board is rather easy, as it needs fewer components. A piece of strip board is enough to make it sturdy. A picture below, how I made one. You’ve to make sure that the power input and audio output wires are thick enough to carry sufficient power. Also don’t forget to mount the TDA2003 IC on a heatsink with a bit of thermal compound. Use the largest heatsink you can. Power supply: You can use a power supply between 12 volts to 24 volts, capable of supplying up to 2 Ampere. This amplifier is somewhat immune to input power noise or ripple. But you should always use a power source with lowest possible ripple to maintain audio quality. The TDA2003 datasheet mentions that it can normally dissipate 20 watts of power. The datasheet also mentions that it can run from a 24 volt power supply. It also can continuously supply 3.5 amps to the load. So why not improve it to get 20 watts out of it ? I think it’s just the matter of using a bigger capacitor at the audio output, a bigger heatsink and a suitable power supply. TDA2003 is a single channel amplifier IC, I’m planning to build a stereo amplifier like 6283 amplifier circuit in future with two TDA2003 IC. What are your thoughts ? Let me know through the comments. From my little experience in this field, I can say always use thick cables, atleast 14 AWG for more than 5′ cable running. I think you don’t need to match woofer and amplifier impedance, to eliminate hum. 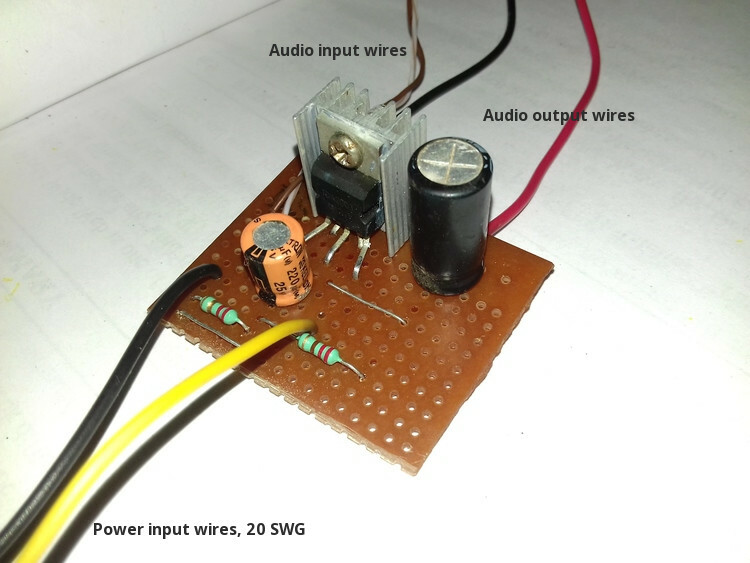 The problem is on the power supply of the amplifier, connect the ground plane(negetive) of the amplifier to earthing wire, and lift up the long wires from ground. It’s on the writing above, please check. 01) Can I use 8ohms speaker for the above circuit? 02) can I use 3w or 05w speakers? You can use a 8 Ohm speaker, it should be at least 4 watt. If you want to use 0.5W or 3W speaker with this TDA2003 amplifier circuit, then replace the 1000uF capacitor with 220uF. Can I put instead 10uf 10v to put 10uf 35v? Hi,i want to design a 5.1 sub woofer amplifier. i am thinking about making each mono amp for each channel. For that i need the best mono amp below 20w. And it has to be 4ohm one. Is TDA2030 an ideal for that ? Yes, you can use TDA2030 or TDA2003, both of packs enough power for your purpose. Hello how i can boost on 20w this amplifier ??? Then you’ve to use TDA2003 in bridge mode.